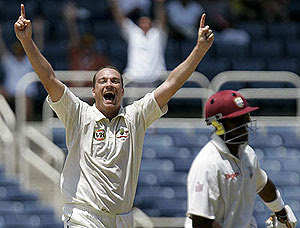 wdnicolson.com - An NRL Blog: 2009/2010 Summer of Cricket: Australian Team for First Test with West Indies at Gabba. 2009/2010 Summer of Cricket: Australian Team for First Test with West Indies at Gabba. Australian selectors have picked the following 12 man squad for the First Test of the 2009/2010 Summer of Cricket against the West Indies at the Gabba starting November 26. Stuart Clark is the big omission - being left out despite his success on Australian soil - with NSW teammate Doug Bollinger preferred for the Gabba Test Squad. When the Australian selectors pick a side do they actually consider the value of a bowler who can bowl line and length? One of the big reasons we didn't struggle mightily post-McGrath was the Stuart Clark factor... but how quickly the selectors forget what is vital to the makeup of a bowling attack. Clark may win a reprieve if Peter Siddle fails to recover from a side strain but his Test Career now looks in serious doubt. Which is a shame because he remains Australia's best Test Match bowler... who can't get a start in a Test Match.